In the year after opening, surveys showed that the Lower Mall at Westgate was achieving lower footfall than the Upper Mall. 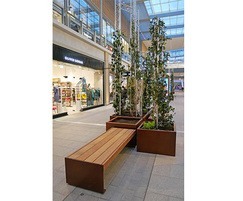 Landscape architects Gillespies were set the challenge of designing new features and spatial arrangements that would visually connect the two levels, to attract more visitors to the Lower Mall and lengthen their dwell time there. 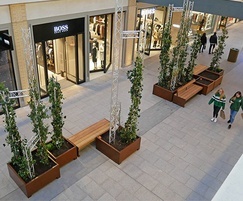 Gillespies’ design proposals comprised a series of informal clusters of seating and planters, with the planters containing high towers for climbing plants that would project through to the level of the Upper Ground Mall above and make visitors more aware of the stores below. 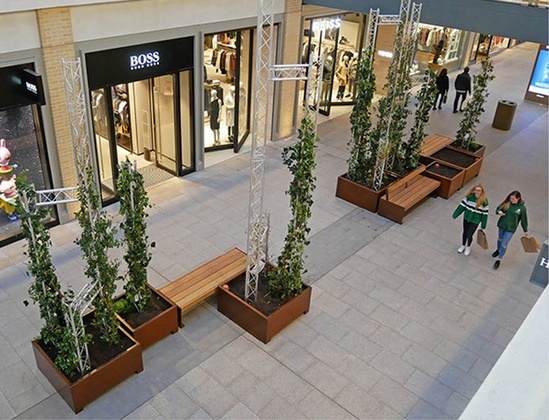 Furnitubes designed, engineered, manufactured and installed 35 planters (17 of which contained aluminium truss towers) and 8 seating units. 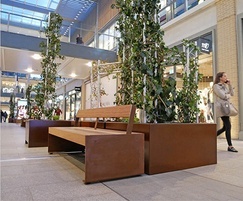 The planters were supplied in corten steel - fully welded to be watertight - and chemically weathered to achieve a visually rich-toned and varied patina, and sealed so the oxidized finish would not cause any staining issues. Aluminium trusses up to 6m high were bolted into the base of the planters for climbing plants to grow up. The seating is from Furnitubes’ Elements XL range, designed to be sufficiently stable to not require fixing down, with 4 units including bespoke backrests. All products are heavy enough to not be easily moved by the public, but can be readily moved by pallet truck if the spaces in the Lower Mall need to be rearranged in future.